Bell’s entry level full face street helmet just got some serious revisions for 2015. While still using the same aggressive angular outer shell shape with great ventilation, Bell is introducing the new Qualifier DLX. The DLX model closely resembles the standard Qualifier with a new streamlined design to accept popular Bluetooth devices via an integrated pod in the side of the helmet. Not to mention, Bell is also including a Photochromic Transitions faceshield right out of the box. With a new helmet of course come new graphics. For those who like to stand out, the Bell Qualifier DLX Hi-Vis Helmet is the only complete Hi-Vis full face helmet in Bell’s current line. If safety is your prime concern, no need to look further than this paint as nothing else will catch your eye quite as well. Reminiscent of a WWII era P-51 Mustang, the Bell Qualifier DLX Devil May Care Helmet is pretty radical. The split silver and green graphic is separated with an open shark mouth, ready to take a bite out of the road ahead. Complemented with 12 exhaust pipes running down each side of the jaw and rivet accents, the Devil May Care graphic adds a ton of style for not a lot of cash. 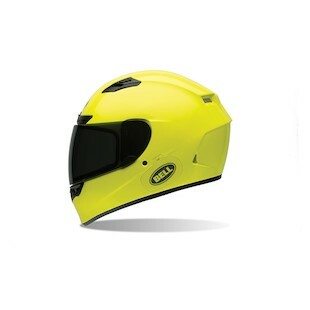 Bell just made a splash in the entry level helmet market. Offering a modern lid with a photochromic visor, versatile integrated Bluetooth accessibility, and stellar ventilation for right around $200 makes the Qualifier DLX pretty tough to beat.